When tax deadlines start to loom, businesses might wonder if they should file for a tax extension. This provision from the IRS has both advantages and drawbacks. Take a look at some of the potential benefits and consequences a business might face if it files for a tax extension. A tax extension can provide up to six extra months to file the required paperwork. After the normal tax deadline passes, an accountant will likely be less stressed and will have a clear schedule for digging into a business’s financial situation. 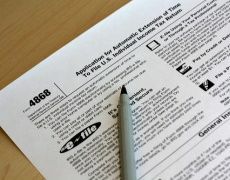 That extra time might even allow an accountant to discover deductions that he or she might have otherwise overlooked. The extra time will also provide the opportunity to double-check calculations, thereby sparing the business from having to file amended tax forms later on. A business can be confident in how much it owes and plan a budget accordingly. Many small business owners want to avoid any additional IRS forms because they do not want to wade their way through complicated language. However, filing for an extension is usually not a complex or lengthy process. Furthermore, there is little weight to the widespread belief that asking for an extension will trigger an audit. An extension can help you avoid the fee for late filing. While extensions help avoid the penalty for filing late, businesses might face a separate penalty for paying their taxes late. Therefore, even if an extension is granted, filing taxes as soon as possible can save businesses money. The late payment penalty is between 0.5 percent and 1 percent of what is owed, and this begins to accrue monthly immediately after the tax filing due date. The extra time for filing taxes might mean other business matters are put off in order to take care of the taxes after the regular deadline. Important client targets and initiatives could remain on your to-do list while you focus is on completing your taxes. If a business needs to apply for a loan, waiting to file taxes could complicate this process. Some lenders require a copy of an up-to-date tax return as proof of the business’s revenue. If a company had not completed a tax return, they might not be able to get the loan they need. Filing a tax extension for a business comes with both pros and cons. By familiarizing yourself with tax laws, businesses can make the wisest choice for their particular situation and business needs. The articles, materials and information (referred to as “Content”) provided via this site are for personal, non-commercial, informational purposes only. None of the Content constitutes, or is intended to serve as, legal, financial or tax advice. The Content does not convey the official position or endorsement of Villanova University. The Content is provided “as is” and without any warranties, representations or guarantees, and any implied warranties, representations or guarantees are hereby expressly disclaimed. Any tax analysis or observations included in the Content may not contain a full description of all relevant facts or a complete analysis of all relevant tax issues or authorities. In addition, any tax analysis or observations contained in the Content is not intended or written to be used, and cannot be used, for the purpose of (i) avoiding penalties under the Internal Revenue Code or (ii) promoting, marketing or recommending any transaction or matter addressed herein. Individuals should consult their legal, financial, tax advisors for a full analysis and advice related to their specific facts.